I am back with another project using the Everyday Elisha Jean Stamp Set from The Cutting Cafe Shop! This time I used the Ruby J. friend a the focus. 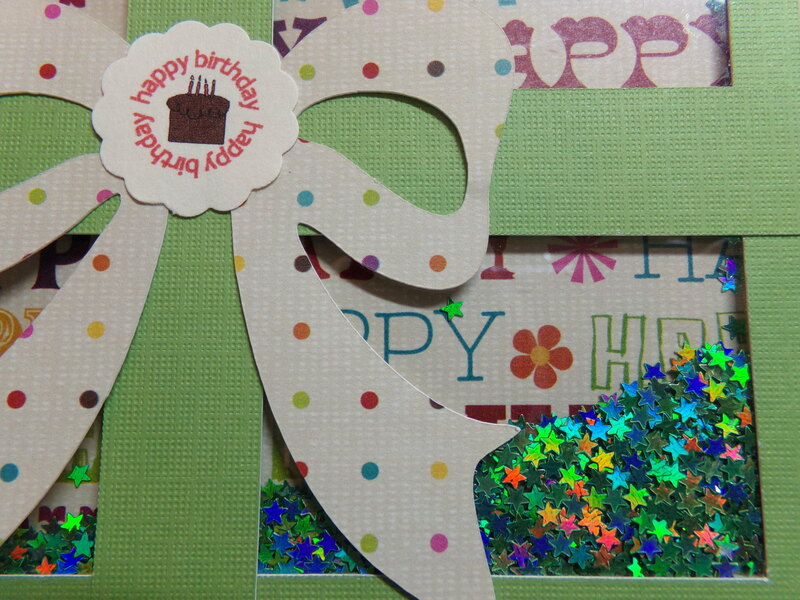 I used bright colored paper and the Assorted Card Folds Set 2 – Fold with Circle Window from The Cutting Cafe. I added clear cardstock (which is also available in The Cutting Cafe Shop) to the window. I made a larger oval and attached my fussy cut Ruby J. to it. In between I added flower sequins and pink seed beads and put together with foam tape. I love how it came out! There will be variety this week at The Cutting Cafe for the design team post as we could choose any file we wanted to work with! Since shaker cards are still very hot right now, I chose to do a candle shaped shaker card from the 6 Assorted Shaker Cards set. It came out great. Make sure you stop by The Cutting Cafe’s blog on the 7th and 21st of each month. Leave a comment and you just might win three free files! Regina pulls a winner from the comments left on the previous post. The design team at The Cutting Cafe is shaking things up this week with fall and Halloween shaker cards! There are so many to choose from. Just take a look here and here! 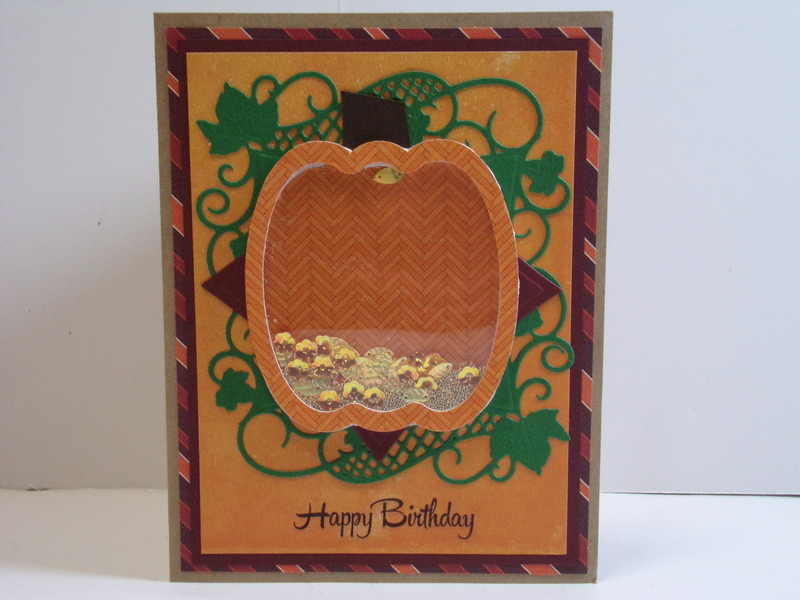 I chose the Pumpkin Shaker Card Template version to use. 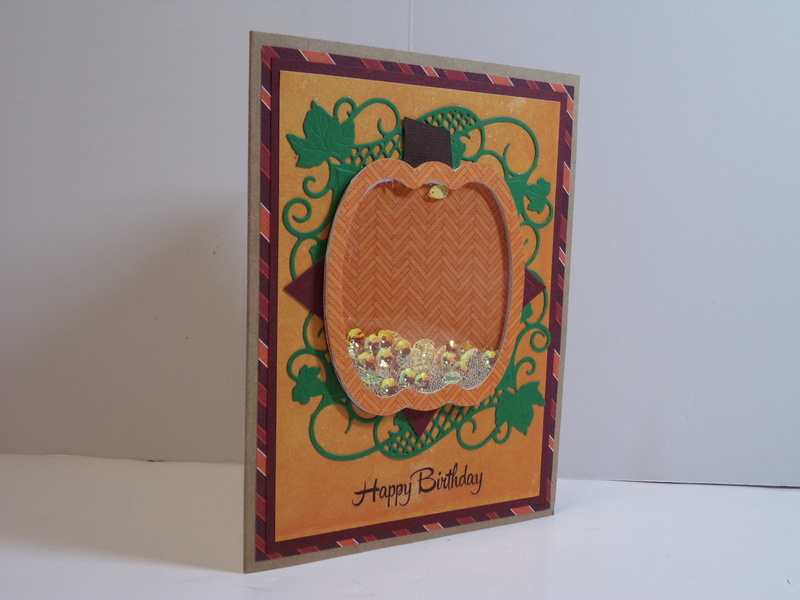 I put the shape on a card, but you can also make the whole card pumpkin shaped. I love the fall colors of this and the shaker has flower and leaf shaped sequins and gold microbeads. I decorated the inside too. 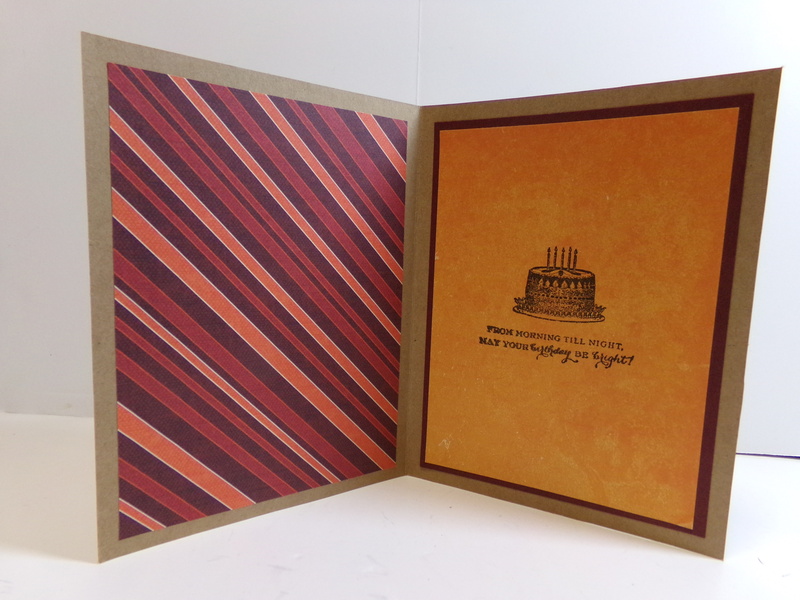 Make sure you stop by The Cutting Cafe Blog to see what the design team members came up with. We post on the 7th and 21st of each month. Stop by, get inspired, and leave a comment! We love reading them and you get a chance to win three free files of your choice when you do! As always for my design team projects, here is my video! Thanks for stopping by! 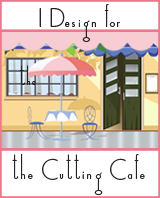 It is time for another design team post for The Cutting Cafe. 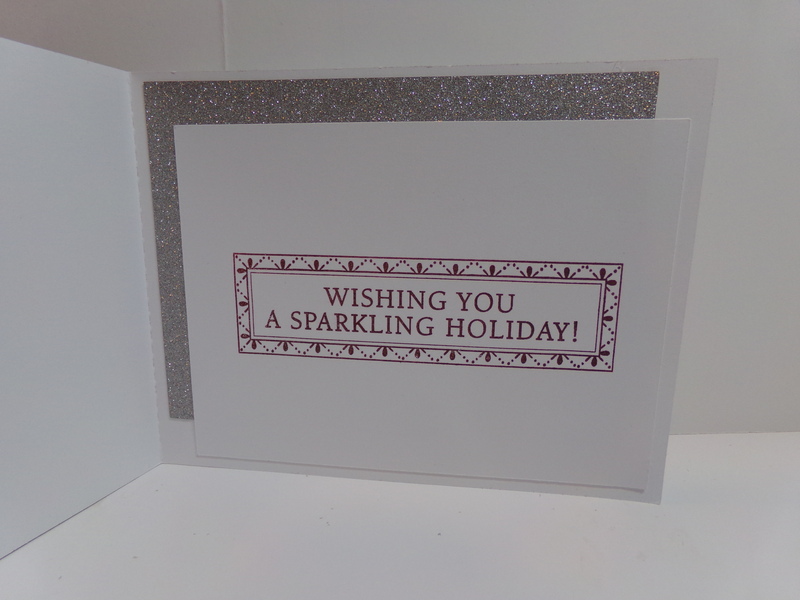 This time we are all about Christmas and shaker cards. 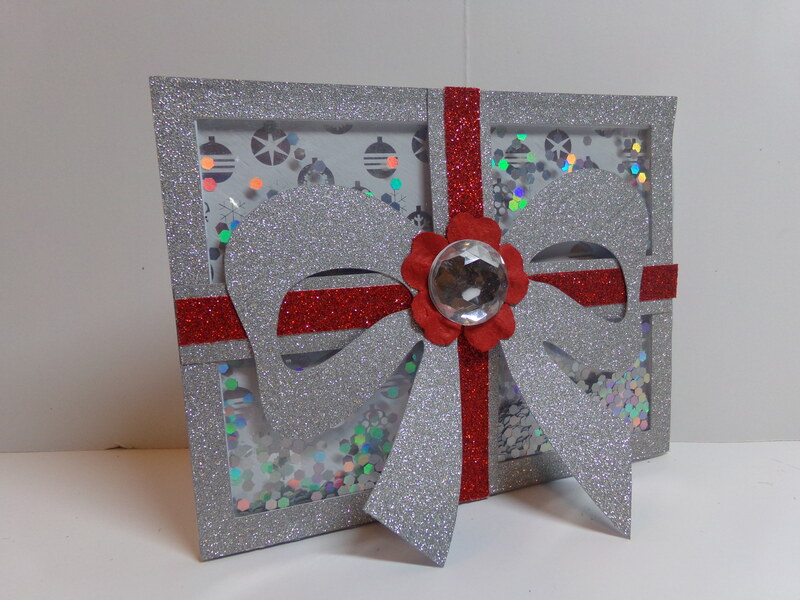 We could choose from either the Christmas Word Shakers or the Christmas Shape Shaker Cards which I used. 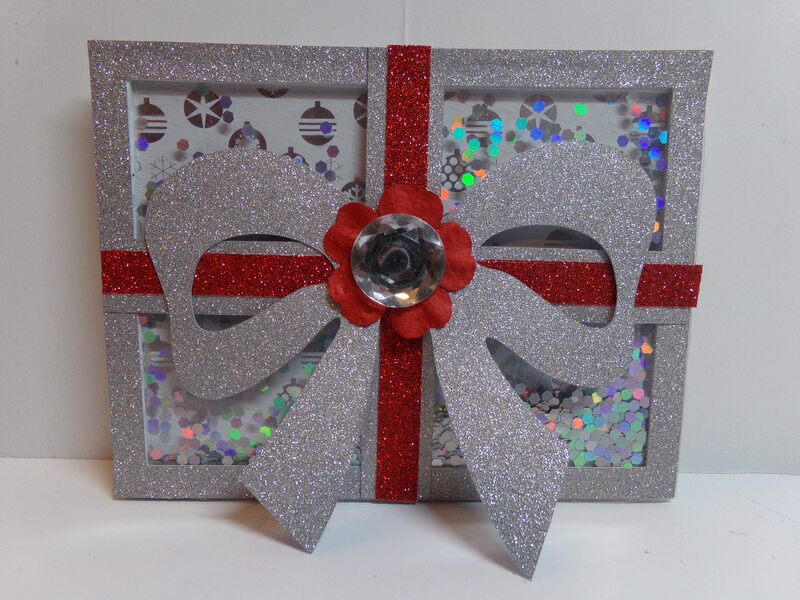 This file comes with eight different shapes including a bell, a snowman, a mitten, and the present that I used. 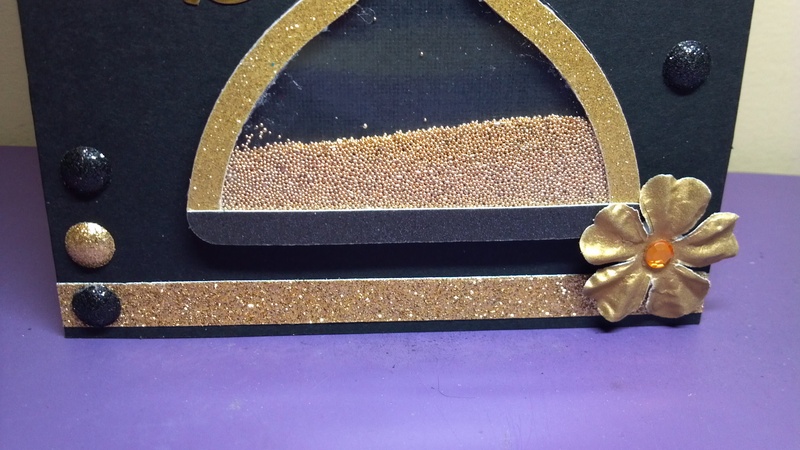 I used glitter paper and added foam tape to create the shaker area. There is a tutorial on the website on how to make the shakers as well as written directions in the file. They are really easy to make. 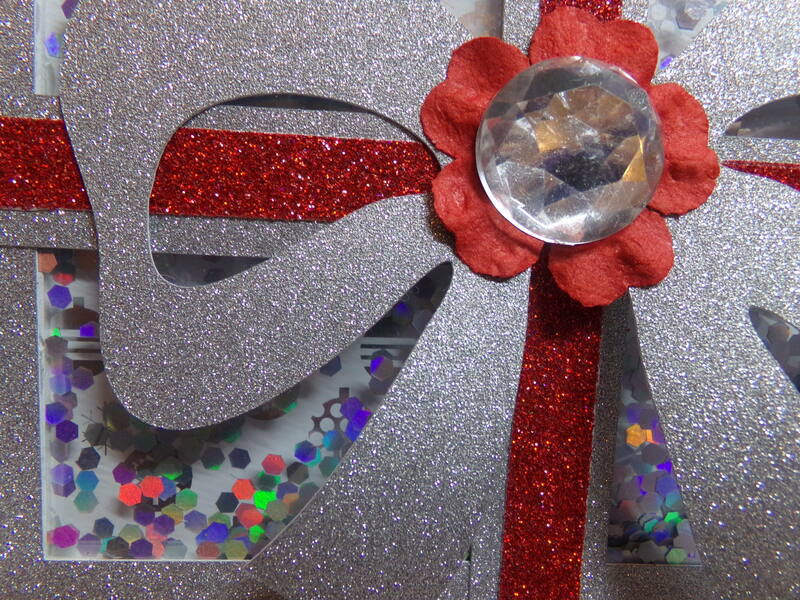 I used hexagon shaped glitter from Martha Stewart for my shaker element. 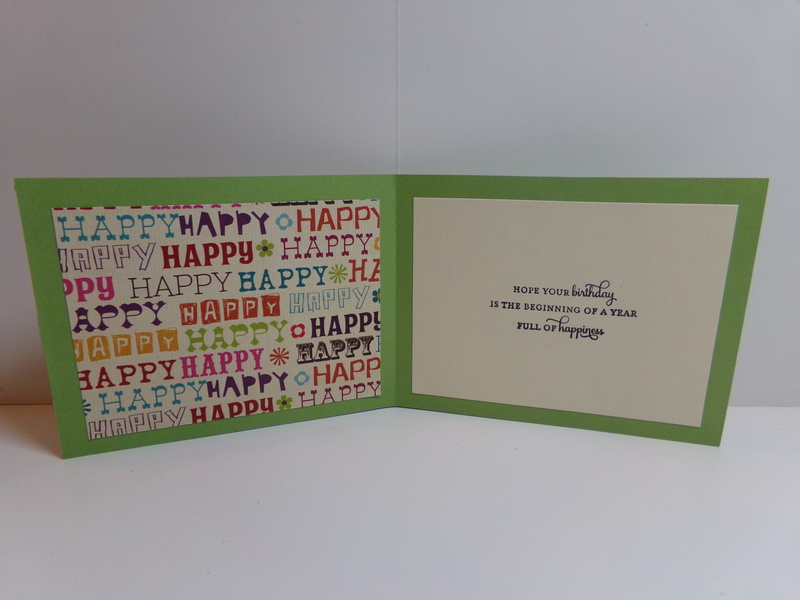 I changed the size of the card and made the bow smaller so the background paper would show. Be sure to visit The Cutting Cafe Blog on the 7th and 21st of each month as we posts our projects on those dates. We love to read your comments! So when you leave a comment, you are included in a random drawing that will take place on the next post date. If your name is selected, you will win three free files! We are shaking up some fun at The Cutting Cafe this week with a whole new line of shaker cards! There are 13 different versions and you can find them all here! 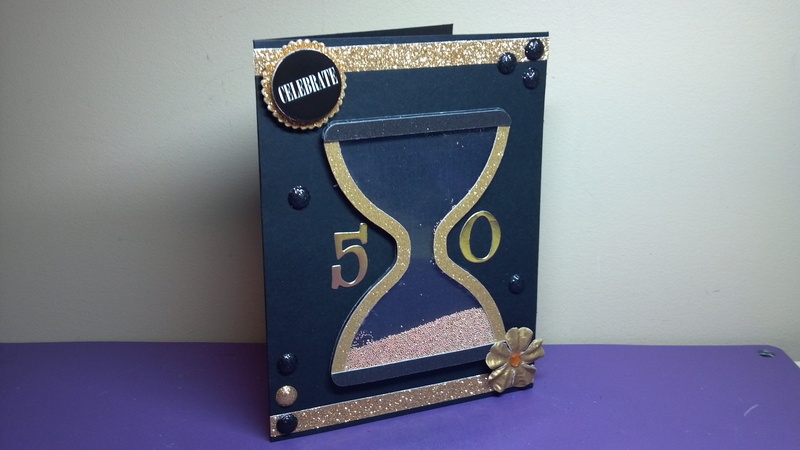 I used the hourglass version to make a 50th birthday card for a friend. 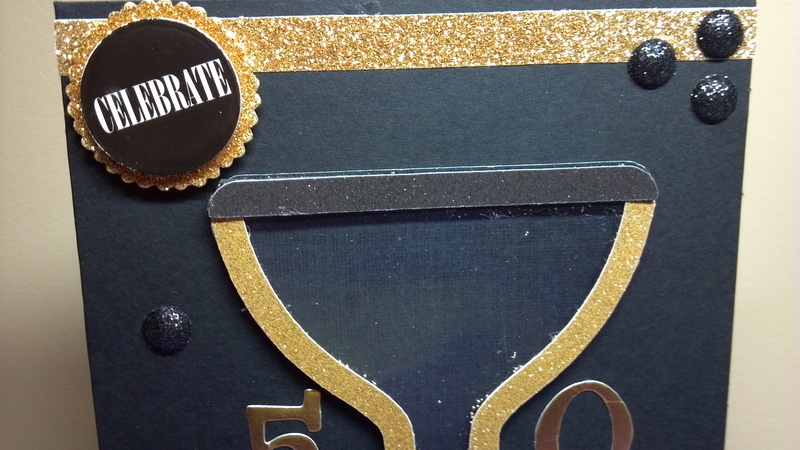 Of course I used black and gold for the honor! 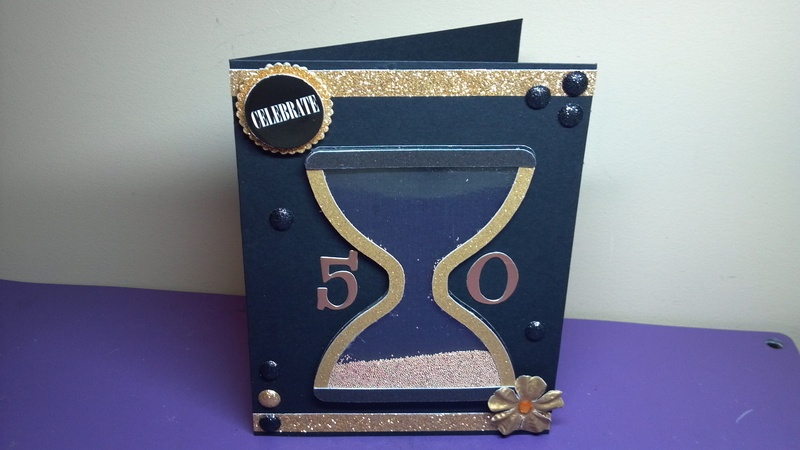 I kept the card very simple in hopes of making the shaker 50 and the hourglass the focal points. Shaker cards are really fun to make and easy once the intimidation factor wears off. The Cutting Cafe helps you with that also as design team member Tmika did a video tutorial on how to make them which you can find here.